This list encompasses several different eras of the draft and goes all the way back to the Vikings’ first draft in 1961. This week, I’ll be counting down the 25 biggest draft “steals” in Vikings history. This list encompasses several different eras of the draft and goes all the way back to the Vikings’ first draft in 1961. The working definition of a draft steal in this case is a player who ended up being quite productive relative to where he was chosen — whether that meant a first-round pick who was passed up by other teams and went on to have an amazing career or a late-round choice who also had success. Undrafted free agents weren’t considered (sorry, John Randle). 25. Jesse Solomon, 12th round pick, 1986: As the last of the Vikings’ picks in 1986, Solomon was a long shot to make the roster. The linebacker ended up playing 45 games for the Vikings — with 33 starts — before being traded in the middle of the 1989 season to Dallas in a massive deal. I forget who the Vikings got in that deal, but it rhymes with Schmerschel Schmalker. 24. Adrian Peterson, 1st round pick, No. 7 overall, 2007: This was a pretty strong first round, but I remember thinking the Vikings were going to take Brady Quinn at this slot. Instead, they chose their greatest running back in franchise history and one of the NFL’s greatest rushers of all-time. That qualifies as a mild steal, even at No. 7 overall. 23. Dave Osborn, 13th round pick, 1965: The Vikings had 20 (!) draft picks back in 1965. Imagine trying to do that mock draft. Maybe they were bound to hit on a few late ones, but Osborn qualifies as a steal in the 13th round. The running back gained more than 4,300 yards on the ground and 1,400 via pass receptions in his Vikings career. 22. Wade Wilson, 8th round pick, 1981: I’m not sure how many eighth-round picks in NFL history ended up having careers that spanned 18 seasons, but Wilson (1981-1998) qualifies. He appeared in 125 games, making 69 starts — with 48 for the Vikings, when he compiled a 27-21 record. 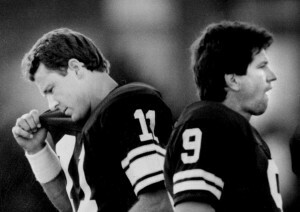 He was the QB for the Vikings during their 1987 playoff run, when they almost made it to the Super Bowl. 21. Danielle Hunter, 3rd round pick, 2015: As a co-worker remarked when I showed him this list, there’s a good chance Hunter will be higher if things are re-calibrated in 5-10 years. He has a chance to be an elite player, and he’s already a steal after being taken in the third round two years ago. After Wild loss to Blues, a question: When does playoff misery end?